-IRAQ is one of the states in the Middle East that actually was created by the British Empire, in 1922, after World War I, with accordance to British interests at that time. IRAQ has a population of approximately 25 millions people (03/2007) and stretches on 438,000 km in the Eastern side of the Middle East. About 22% are Kurds, 60% Shiites and only 15% Arab Sunnites – the rest are Christians. IRAQ is a very rich country with huge oil reserves. 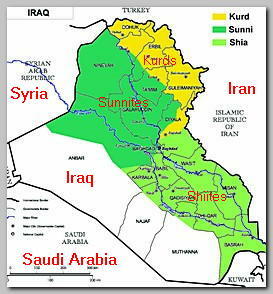 Kurds, that were on a verge of an independent state of their own, Sunnites that share an historical religious dispute with Shiites, all were force in 1922 to share one political identity – IRAQ. It is, therefore, no wonder, that a genuine feeling of IRAQ s’ nationality and identity is somehow artificial. Repression and oppressive regime were in IRAQ always the best way to keep IRAQ intact. Bloody coups, abusing of human rights and ongoing civil wars against Kurds in the North or Shiites in the south characterized the country in the last 50 years. Saddam Hussain ruled the country from 1976 as vice president and from 1979 as president. He was a cruel despot, even in IRAQi standards, and dragged IRAQ to catastrophic wars against Iran in 1979, against Kuwait and USA in 1991 and again in 2003. Saddam Hussain butchered Shiites and deported Kurds in an ethnic cleansing but he also oppressed Islamic militants as he saw in them a threat to his Baath party and the, so called, socialist IRAQi regime. IRAQ was involved in terror only through supporting and encouraging Palestinians to fight Israel – the enemy of the Arab World in his point of view. IRAQ also largely compensated families of Suicide bombers and victims of the war against Israel. After USA invaded IRAQ and threw over Saddam regime in 04/2003 all the abnormality of IRAQ breached out. The Democracy USA pretended to establish in IRAQ turned out as a recipe to anarchy and civil war. (See also – US INTEL’ SOURCES ) . Today (05/2007) IRAQ is in civil war and the Americans are facing disaster there. Muslim Militants from all over the world are streaming to IRAQ to fight the USA. The war in Afghanistan against the Russians in the 80ies was the breeding ground of Al Qaeda and the Global Jihad. The war in IRAQ is the hothouse for the next generation of Islamic Global Jihad that is now consolidating in IRAQ.